I now have my solar panels installed! This isn’t the greatest picture but I was backed up at the end of my yard trying to get a better view. The good news is I hardly notice them on my house since they are in the back. I have 40-260w panels for a total of 10.4 kW of generating capacity. 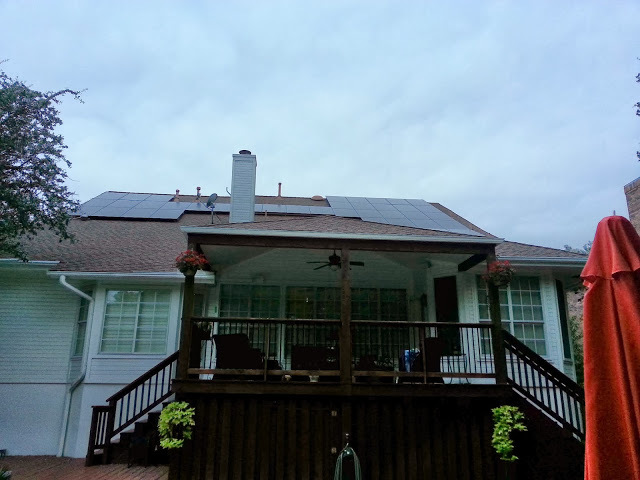 I also have two inverters on the side of my house that convert the solar power that is DC power into usable AC power. This should more than cover at least half my usage (approx. 60% at current usage levels). The only problem is they aren’t live yet on the grid. The panels were about a month behind schedule due to a tremendous amount of rain we’ve received in central Texas over the last month. This led to over 4 weeks of delays. If you read my post back on Sept 7th, posted here, the panels were supposed to be installed by the end of last month. Well they finally finished up last week and a proposal was just sent in to the city for inspection. The city has to come out and do two separate inspections, one for the panels, and one for the electrical system. So I’m looking at being able to generate solar power by the year’s end. This process took longer than expected but I’ll get to enjoy a lower utility bill for the entire 2014 year. I’ll be sure and post updates on how my production is going versus the projections I received. I’m also getting a monitoring system installed so I can see from my phone how much power I’m generating at any minute of the day. That’s great news AAI. I’ll be curious how the forecasts compare to the actual production. Did the price come in as expected? I remember you forecasting a 7 payback and a 25 year design life/warranty for the system. Is that still what you’re thinking? The costs of the system were spot on. Those numbers were from the final contract. I still have to wait until tax time to get the rest of my credits from the government but my installing company has to deal with getting the local credits reimbursed to them. As for the production, only time will tell. The ROI looks awesome to me and even being conservative, I think this will prove to be a good investment. I’m looking forward to actually getting to see the production and cost savings on my monthly bills. Since I have the monitoring system, I’ll know exactly how much I produced and saved over the course of a year. I’ll be sure to post updates. As with Fast Weekly, this will be something interesting to see how it plays out in comparison to the projections over time. Definitely looking forward to seeing some of the future updates. I’m definitely anxious to see how it plays out and I’ll be sure to post results.